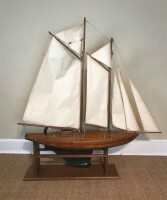 A large Edwardian wooden pond yacht circa 1910 on later stand. 52 inches wide 12 inches deep 57 inches high. 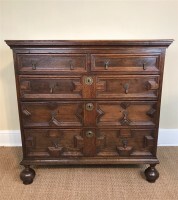 A Jacobean oak block fronted chest of drawers circa 1680 on later turned bun feet. 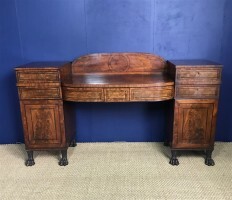 A Regency mahogany and ebony strung pedestal sideboard c 1820 of the finest quality constructed from beautifully figured cuban mahogany on lions paw feet. 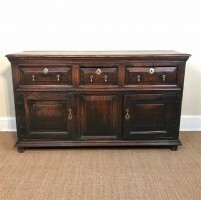 A George 11 oak lowboy circa 1750 with three frieze drawers with original brass handles on unusual ring turned legs. 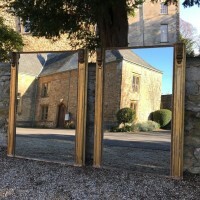 A matched pair of William IV pier mirrors circa 1835 with the original water gilding and hand silvered mercury plates. Provenance: A Bayswater Townhouse . Both 80 inches high one 62 inches wide the other 56 inches wide. 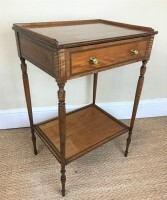 A mid 19th century English satinwood and ebony cross banded two tier lamp table circa 1840 with a single frieze drawer on turned tapering legs. 20.5 inches wide 15.5 inches deep 31.5 inches high. 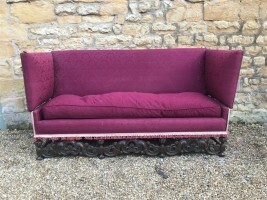 Price to include repairs to one column and a gentle wax all over if required. 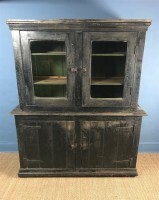 A late 19th c Cornish glazed kitchen cabinet . Launceston c 1890 of tongue and groove construction and the original bitumen paint . A Heals oak 2 door wardrobe circa 1930 the interior bearing an ivorine Heals label Tottenham Court Rd London W1. A Chinese lacquer coffee table circa 1920 in Qianlong style and beautiful original condition with chocolate coloured ground. 39 inches wide 20 inches deep 16 inches high. A large Anglo Chinese Export lacquer table circa 1850 with bold gilt Greek key border on square base . An unusually large West Country Pine cricket table circa 1830 in excellent solid condition. A 1930s opaline glass and brass dish light in good condition with no chips or cracks. 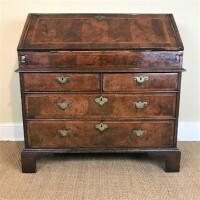 A George 1 walnut bureau circa 1725 in rich well figured timber cross banded and feather banded the interior well shaped and with a well above a waist mould and two short and two long drawers on bracket feet. The escutcheons and handles 18thc and correctly placed but probably not original. An early George 111 mahogany and parcel gilt wall mirror circa 1760 of Swansea type in totally original condition with wonderfully distressed silvered mirror plate. 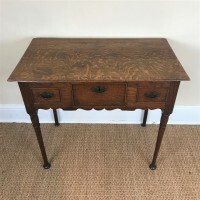 A rare Queen Anne pine dresser base circa 1710 with the original crusty patination having three frieze drawers with fielded panels above a pair of panel doors on stile supports. A Regency mahogany stool 1820 in the style of Gillow in good original solid condition with no breaks ready for a final cover. 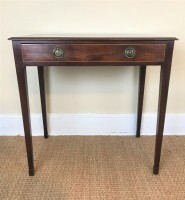 A George 111 mahogany side table circa 1800 with single frieze drawer in lovely original condition. 28 inches wide 18 inches deep 28 inches high. 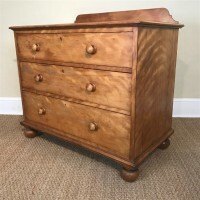 A Victorian birch wood small chest of drawers circa 1880 on turned feet.